While lower back pain seems to get all the attention, upper back pain is increasingly a problem, especially with more people spending time working at a computer, which often leads to bad posture if the computer is not ergonomically adjusted. Seeing someone hunched over a laptop is a common sight these days. It can also be caused by an acute trauma to the neck, such as whiplash from an auto accident. Chiropractic care can be a useful tool for this type of pain. Also called thoracic back pain, upper back pain can either develop slowly over a few days or weeks, or may appear quickly as the result of an injury. You may first notice stiffness and aching between the shoulder blades or dull pain extending across your shoulders, which can become gradually more painful as time goes on. As the muscles and vertebrae of the upper back and neck are so closely connected, you may also feel neck pain and stiffness. This condition can make it difficult to move normally while doing daily tasks, and even make it difficult to sleep or roll over in bed. Upper back pain may be caused by stress, tension and bad posture, or possibly may be related to arthritis, a disc injury or rib joint dysfunction. Both emotional stress, such as problems with job, finances or family, and physical stress due to a bad diet, lack of exercise or environmental pollutants, can contribute to this type of pain. As the thoracic part of the spine is designed primarily to create stability in the trunk, upper back pain is less commonly caused by degenerative disc diseases such as scoliosis, and is more usually due to muscle strain and tension causing pain and a slight dislocation of the vertebrae. While anti-inflammatory medications or other pain relievers may be used to help relieve pain in the upper back, they do not address the underlying cause of the pain, which could lead to it becoming chronic. Our Tampa chiropractors at Sheldon Road Chiropractic & Massage Therapy can treat the cause in a safe, comfortable way. Your pain may be caused by a chiropractic subluxation, which is when one of your vertebrae becomes slightly out of alignment due to muscle tension or stress, putting pressure on a nerve. A chiropractic adjustment can realign your vertebrae, alleviating the pain. A certified chiropractor can treat the muscle strain and/or joint dysfunction that leads to upper back pain, and will work with you to develop an effective treatment strategy targeted to your specific needs, which may involve chiropractic adjustments and suggestions for changes in diet and exercise. Our Tampa Chiropractors may also recommended Massage Therapy depending on the patient's presentation. In the case of a disc injury in the neck Spinal decompression therapy may be recommended. This is a treatment in which the bones of the spine are gently pulled apart using traction. By increasing the space between the vertebrae, pressure on the nerves can be relieved and pain significantly reduced. MLS Laser therapy can also be used to heal damaged cells and stimulates inter-cellular activity. This reduces pain in the area of injury and speeds recovery of the damaged cells. To determine the cause of pain in your upper back & the process to eliminate this discomfort, please call us at or send in your Appointment Request and we will contact you as soon as possible. "Referred Pain".. what is it? “Referred pain” can be a perplexing phenomenon for anyone who experiences it. Referred pain is what happens when you feel pain in an area of your body that is not actually the original source of the pain signals. The most common example of referred pain is when pain is felt in the left arm, neck or jaw of a person suffering a heart attack, while they often have no feelings of pain in the chest area itself. 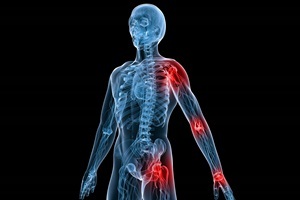 It’s important to note that referred pain is different from radiating pain, in which the pain felt in one area travels down a nerve, causing pain along the length of the nerve. This is often the case with sciatica, where pain originates in the lower back and radiates down the leg. Some experts believe that it is due to a mix-up in nerve messaging. The central nervous system (CNS) is constantly receiving a barrage of different messages from different parts of the body. These messages may get mixed up somewhere along the path between the place where the irritated nerve is signaling and the spinal cord or brain where pain signals are processed. With an extensive network of interconnected sensory nerves that serve the same region of the body, such as the nerves of the lower back, thighs and hips, it may be more common for signals to get mixed up than you might imagine. Although referred pain is usually felt as painful, it can also cause feelings of numbness, tingling or the sensation of pins and needles. Another example of referred pain is a tension headache, in which headache pain is due to an irritation of the nerves in the neck. Referred pain tends not to cross sides of the body. In other words, if the pain signals are originating in the liver or gallbladder (which are on the right side of the body), you may feel pain in your right shoulder. If the signals originate in the pancreas (on the left of the body), you may feel pain in your left shoulder, etc. Chiropractic adjustments can address the source of the referred pain, leading to long-term pain relief. Nerves in the area of the spinal cord that are irritated due to a spinal misalignment (subluxation) can be a cause of referred pain. When your chiropractor adjusts your spine, he or she removes the source of irritation, thus providing relief. The Doctors at Sheldon Road Chiropractic and Massage Therapy in Tampa are experienced in determining the origins of where pain comes from by utilizing digital x-ray, performing orthopedic tests and reviewing patient health history. Chiropractic care is an important tool in the arsenal of any professional athlete. It has been shown to help reduce injuries, speed healing time and improve performance. In our office, both Dr. Karen and I have had the honor of treating professional athletes and aiding them in recovering from injury and maintaining optimal spinal health and fitness. A number of professional American sports teams have a chiropractor on staff, including the NFL, NBA, MLB, PBA, Nascar and more. Professional golfers routinely use a chiropractor during tournaments, as golf can produce a great amount of stress on the vertebrae due to twisting. Well-known professional athletes such as Michael Jordan, Lance Armstrong, Tiger Woods, Joe Montana and many others have reported how they have benefited from chiropractic treatment. A study conducted in 1991 by researchers Anthony Lauro and Brian Mouch, which was published in The Journal of Chiropractic Research and Clinical Investigation, found that athletes under chiropractic treatment were able to improve their performance an average of 10.6% over six weeks and 16.7% over a period of 12 weeks. The researchers noted that, as the study was only 12 weeks in duration, and athletic performance continued to improve during that time, it is possible that further enhancement may be possible with longer chiropractic treatment, though at what point improvement would level off is still unknown. Formal football player Jerry Rice shares his successful experience with Chiropractic care! To watch this video click on this link and scroll to the bottom of Sheldon Road Chiropractic & Massage Therapy's video page. Osteoarthritis is an inflammatory disease of the joints that is characterized by inflammation and degenerative breakdown of our joints both in the spine and extremities. Chiropractic care can help those who suffer from osteoarthritis by improving joint alignment and range of motion. A normally functioning joint moves easily, supported by a cushion of firm, rubbery cartilage that allows the bones to slide smoothly over one another. Osteoarthritis is caused by a breakdown in the cartilage of the joint, which allows the bones to rub together as they move, leading to pain, stiffness and swelling. 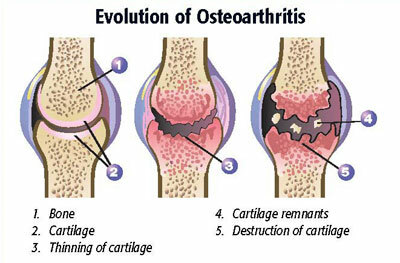 It is estimated that 50% of the population over age 55 has some form of osteoarthritis. As a person ages the content of water in the cartilage decreases, hastening its breakdown. Some tissue from the breakdown of this cartilage can be released into the synovial fluid of the joint capsule, causing inflammation. Though any of the body’s joints may be affected, the most common complaints are of pain in the knees, hips and hand joints, the ones that bear the greatest load and do the most work. Symptoms of osteoarthritis are pain, swelling, stiffness and crepitus, which is a term for the clicking or popping sound the joint makes when the ends of the bones in the joint rub together due to an insufficient cushion of cartilage. The first sign you may have osteoarthritis is frequently waking with “morning stiffness” in your joints that gradually improves as the day goes on. Pain may become worse when you are active, improving with rest. Though there is no cure for osteoarthritis, there are things you can do to slow its advance and alleviate the pain. The least invasive treatments involve changes to diet and lifestyle, along with chiropractic care. Eating whole fresh foods and losing weight can take much of the pressure and stress off your joints. In addition, regular light exercise can strengthen the muscles that support the joints. Exercise can also improve range-of-motion, balance and posture. Swimming is an excellent form of exercise for those with osteoarthritis, as it allows you to exercise without putting stress on your joints. A trained chiropractor can use a variety of safe and gentle methods, like the Percussor Technique and Arthrostim Adjuster, to return your joints to proper alignment, which will help alleviate pain without having to resort to taking excessive pain medications. Studies have shown that chiropractic treatment can increase range of motion, improve joint coordination, relax tense muscles and reduce pain. A chiropractor can also recommend the best exercises and stretches targeted to your specific needs. The Chiropractor's at Sheldon Road Chiropractic & Massage Therapy in Tampa have also found new technology, like MLS laser therapy and Spinal Decompression therapy to be very effective in alleviating pain caused by osteoarthritic changes in the body. Don’t wait until the pain becomes unbearable, schedule an appointment with Our Doctors to see how we can help heal your specific needs! At your convenience, please check to make sure you are contacting our office on the main phone line at 813.884.1457. This is the best and most direct way to reach us. Thank you in advance for confirming the contact information is correct. We are now In-Network with Aetna! We are ready to announce the massage winner for April! Our March massage winner has been selected! Find Out How You Can Win A Massage On Friday the 15th! Dr. Liz Gionfriddo's Sign Is Now On Our Building! Our First Hour Massage Winner for 2019 is...! Are You Dealing with Neck Pain? What Can Spinal Decompression Treat? What Are Alternatives to Disc Surgery? Time to announce the *2* winners of our October massage drawings! Time to share who the massage winner is for the month of September! Hurry & sign up to win a 1 hour massage, it's simple! We are ready to announce July's 1 hour massage winner! When was your last massage? And our massage winner is..
Stay Tuned! The winner will be announced Friday! Like us on Facebook or Follow us on Instagram for your chance to win! Welcome to Sheldon Road Chiropractic and Massage Therapy Dr. Liz! A lucky winner will be selected on Friday the 13th for a 1 hour massage! Interested in massage? Sign up for our massage drawing taking place this Friday! Quarterback Drew Brees Uses Biofreeze too! The August Massage Winner is..
A Warm Welcome to Dr. Scaz! We are now in network with AETNA INSURANCE! Dr. Karen Derr celebrates 20 years of Chiropractic! Consumer Reports asks "Should you visit a Chiropractor for back pain?" What Should I Expect At My Chiropractic Appointment? Degenerative Disc Disease, What Is It? How Many Chiropractic Adjustments Will I Need? The Benefits of Massage/Manual Therapy are Endless! Do I Really Need Too Treat With A Physician Within 14 Days Of My Car Accident? Biofreeze-- How Does It Work? "Referred Pain"-- What Is It? How Does ArthrostimÂ® Adjusting at Sheldon Road Chiropractic Work? We are now carrying RockTape kinesiology tape which is excellent for healing injuries! And April's lucky massage winner is...! A one-hour massage will be given to one lucky winner in April! Our Holiday Schedule For the New Year-- 2016! Laser Therapy-- What is it? A Holiday Massage Will Be Gifted To One Lucky Winner! Arthrostim Adjusting Technique: How Does It Work? Automobile Injury? Our Experienced Tampa Chiropractors Can Help! Have You Personally Experienced the Benefits of Biofreeze? October's One Hour Massage Winner is..
October's One Hour Massage Therapy Drawing Will Take Place Soon! Benefits of Massage/Manual Therapy are Endless! Leg Pain & Numbness: What does this mean? Our Office Will be Closed for Labor Day, Monday Sept 7th. Have You Signed Up for Our Free Massage Drawing? Winner will be selected today! Can Your Telephone Cause Pain in Your Neck? Frozen Shoulder-- What is it? How can it be treated? Free 1 Hour Massage Drawing! Dark Chocolate- is it good for you? When Combining Chiropractic Care & Massage Therapy- The Benefits Are Exceptional! Automobile Injury? Your Tampa Chiropractor Can Shorten The Road to Recovery. What is sciatica? How do we treat it? What is Electro-Stimulation Therapy? Why do we use it? Did you know your muscles have memory? This months massage therapy session winner will be announced at 6 p.m. Formula 303: Break the Chain of Pain! The August 1-Hour Massage Winner is..
Steps you can take to increase your energy level. July's One-Hour Massage Winner is..
June's 1-Hour Massage Winner is..
Myofascial Release Technique â€“ What Does it Do and How Can it Help Me? The winner of the March Massage Drawing is..
What Are Food Cravings? Is Your Body Really Trying to Tell You Something? Dr. Oz discusses Laser Therapy on his show "No Pill Pain Busters"
Keep up to date with your Vitamin C intake this Flu Season! And December's 1 Hour Massage Winner is..
And November's 1- Hour Massage Winner is..
Halloween at Sheldon Road Chiropractic & Massage Therapy in Tampa! Can Vitamin C Really Help Your Immune System? Congratulations to Our Star Athlete Jan Thompson! How Does ArthrostimÂ® Adjusting Work? Leg Pain and Numbness: What Do They Mean? Is Your Telephone Causing Your Neck Pain? What is Frozen Shoulder and How it Can it Be Treated? Is Dark Chocolate good for you? Can I use my Flexible Spending Account for Chiropractic Care? Shortening the Road to Recovery After an Automobile Injury: Your Tampa Chiropractor can help. What is Electro-Stimulation Therapy and why do we use it? And the Free 1 Hour Massage Winner is..